What is the SMIC and what is an SDF ? Where is the Stade de France? And why was ex-preident Sarkozy summoned before judges in 2014? Answers to these questions and plenty more on this S page of the dictionary of France. S.A. , Société Anonyme : the French equivalent of a British PLC or Public Limited company. A French Société Anonyme is a joint stock company with at least seven shareholders, and a minimum capital of 37,000 Euros for a non-quoted company, or 225,000 Euros if the company has a stock market quotation. See also SAS. Sacré Cœur : Fine nineteenth-century basilica, sitting on the Butte Montmartre, a hill in the north of Paris overlooking the city. Saint-Cyr : French military academy, the equivalent of the US West Point or Britain's Sandhurst. Located at Saint Cyr l'Ecole, just west of Paris, this military academy was founded under Napoleon in 1802. It trains the elite officer corps of the French army and of the Gendarmerie, the national police force that comes under military command in France. Graduates of this school are known as Saint-Cyriens. for most of its existence the school has only trained male students; but in 1983 it was opened up to female recruits. The school has a second campus at Coëtquidan, in the west of Brittany. Saint-Laurent, Yves : (1936-2008). The most famous French fashion designer of the second half of the twentieth century. Taken on as a teenager by Christian Dior in the early fifties, Saint-Laurent so impressed his boss that Dior chose him as his successor. When Dior died suddenly in 1958, Saint-Laurent found himself head designer at the age of 21. After serious health problems, Saint-Laurent set up his own haute-couture (high fashion, designer clothes) company in 1961, with industrialist Pierre Bergé. After that, Saint-Laurent never looked back, as his fashion house became reputed as the trendsetter in French high fashion. Samaritaine, la. - one of the most famous department stores in Paris, and for a long time the biggest. The store, which had financial problems, closed in 2005 - officially because the old buildings did not meet modern safety standards. In theory, once the buildings have been totally renovated, the store will reopen in 2011. SAMU - Service d'Aide Médicale d'Urgence : The French emergency ambulance service. SAMU units are attached to hospitals with emergency departments, and can be called up using the national emergency phone number, which is 15. Sans papiers, les - expression used to refer to those who would be known as "illegal immigrants" in English-speaking countries. Sans papiers, literally people without papers, are aliens who are in France without having the required residence or work permits. Though accurate figures are impossible to establish, 2009 estimates put the number of sans-papiers in France at between 200,000 and 400,000. Recent governments have adopted increasingly firm policies with regard to the expulsion of illegal immigrants, but there has been no noticeable drop in the number of sans papiers in French cities. In 2009, French residency was granted to almost 7,000 sans papiers whose children were officially enrolled in school in France. Sarkozy, Nicolas, born 1955. President of France 2007-2012. Conservative politician. As Minister of the Interior (Home Secretary) under Jacques Chirac, and president of the conservative UMP party, Sarkozy earned a reputation as a tough-talking no-nonsense hard-liner. He became the bugbear of the Socialist opposition, and the bogeyman of the far left, to the extent that the 2007 presidential election was as much about stopping Sarkozy as about electing a president. In the end, Sarkozy emerged as the most convincing candidate, and won the election with a clear majority. The son of a Hungarian immigrant, Sarkozy has a background very different from that or any other recent French president. More Atlanticist, less nationalistic, he set about strengthening links betwen France and the USA and France and the UK, while reaffirming links with France's continental neighbours. He also sought to strengthen the links betwen the countries surrounding the Mediterranean. He pledged to reform France during his presidency, but his reforms were all watered down in the face of strong opposition from French trade unions and also from members of his own party, fearful for their seats in parliament or local authorities. He did manage to push through a significant, but not very radical, reform of higher education, and a reform of the French state pension scheme; but he failed to address France's massive debt problems, the continued rise of the far-right, or the problem of endemic unemployment; and his timid pro-business measures were lamabsted by the opposition as "presents for the bosses". All his attempted reform measures displeased more people than they pleased, and in the end he lost his bid for reelection in 2012, being replaced as president by François Hollande. After leaving office, Sarkozy kept a low profile; but in 2013 rumours began to circulate that he might make a return to politics, and stand for the presidency again in 2017. These were fuelled in particular by the bitter in-fighting that split the UMP party between the hardliners, lead by Jean-François Copé, and the centre-right, led by former PM François Fillon. In an internal election to choose the party leader following the failure of Sarkozy to obtain reelection in 2012, Copé – whose team organised the election – was proclaimed leader, by a very narrow margin. The result was hotly contested by the Fillonists. Copé was finally ousted in mid 2014 following revelations of his relations with a company, called Bygmalion, accused of seriously over-invoicing the UMP for its events management services. Amidst all this blood-letting, the UMP decided in May 2014 to appoint a triumvirate of former Prime-Ministers (Juppé, Raffarin and Fillon) to lead the party pending the election of a new leader in the Autumn. Against this background, the possible reemergence of Sarkozy as a saviour became the topic of increasing speculation in the media and social media. However, as the new buzz spread, so too did new accusations of his involvement in a raft of illegal operations during the time before and during his presidency. Among these are: a) a Libyan connection, accusations that Col. Ghaddafi helped fund Sarkozy's 2007 election campaign, b) involvement in the rigging of a state payoff to businessman Bernard Tapie over the Credit Lyonnais affair in 2008, c) involvement in the Bettencourt affair concerning accusations of tax evasion by French business empress Liliane Bettencourt (30% share L'Oréal, the company founded by her father). Charges that Sarkozy was involved in the Bettencourt affair were dropped in 2013. On July 1st 2014, Sarkozy was held in detention by Anti-Corruption judges over accusations of trying to pervert the course of justice with regard to investigations concerning the various affairs, notably the Bettencourt affair. Sarkozy supporters claimed that the former president was the subject of a witch-hunt by political opponents, designed to prevent his return to politics and to draw attention away from the poor performance and unpopularity of the Hollande government. In November 2014, he returned to the forefront of political life in France, by getting elected as the new leader of the UMP, and now has a good chance of being chosen as the party's candidate in the 2017 presidential elections. However, in this he faces stiff opposition even within the UMP. SARL - Société Anonyme à Responsibilité Limitée : Private limited company. The SARL is the usual structure for small companies in France: there are some 1.5 million SARLs in France today. For many years, a minimum capital was required in order to set up an SARL, but this requirement has now been removed. The chief executive of a SARL is generally known as the Gérant, or the Directeur. Shareholders are known as associés; the minimum number of members is 2, the maximum 100. Shares in a SARL may only be transferred to a third party with the consent of the other shareholders. SAS - Société par Actions Simplifiée : a corporate structure in between that of SA (Public limited company) and SARL (Private limited company), set up in 1994. SAS are not quoted on the stock exchange. This structure is particularly favoured for the setting up of wholly-owned subsidiaries within a corporate group structure. Saumur : A town in the Loire valley, famous for its national (formerly military) riding school, and its elite cavalry unit, the Black Brigade (le Cadre Noir). Once a military unit, the Cadre Noir is now made up of civilian and military riders; it represents France in international equestrian events, and provides top-level riding displays. Saumur is also known for its white wines. Schtroumpfs, les : In English known as the Smurfs. Heroes of a popular series of cartoon books, the Schtroumpfs are little blue homunculi who live in a village of mushroom houses in the middle of a forest. Theirs is a generally ideal world, far superior to that of humans, a world where the only major permanent threat comes in the form of the human giant Gargamel and his cat Azraël. Sciences Po : Name used, even formally, by the Institut des Etudes Politiques de Paris, an autonomous state-funded school of higher education (grand établissement), founded in 1872, and a university in all but name. The undergraduate course at Sciences Po, designed to produce graduates with a solid understanding of the workings of the modern world, is a pluridisciplinary degree covering a range of social sciences, including history, law, politics, economics, sociology, and foreign languages. Many leading French politicians, businessmen and civil servants have degrees from Sciences Po, and the school's increasing success has led to the opening of smaller campuses, offering specialist courses, in Dijon, Poitiers, Menton and Nancy. Sciences Po is one of the top ranked institutes of higher education in France and in Europe, and competition for places is stiff. The school runs joint degree courses with several top international schools, including the universities of Columbia and Georgetown in the USA, and LSE in Great Britain. Many leading French politicians, businessmen and civil servants have degrees from Sciences Po, and the school's increasing success has led to the opening of smaller campuses, offering specialist courses, in Dijon, Poitiers, Menton and Nancy. The official Aeres audit of Sciences Po in 2008 described the institution as being "seen from abroad as a typically French institution, rather difficult to situate and to comprehend." It defined the school's mission as being to train graduates with "knowledge, but also understanding, of society and the world... in short to educate them". The name ‘Sciences Po’ is also used commonly to refer to Instituts d’Etudes Politiques (IEP) attached to a number of universities. SDF - Sans domicile fixe : person of no fixed address, homeless person. Sécurité Sociale, la (see also Caisse Primaire): the French national health insurance scheme. This expression does not usually translate into English as "social security", but is the French equivalent of Britain's NHS. All people in work pay must pay contributions into the Sécurité Sociale; as a result, they and their dependents receive largely subsidised or free health treatment. In recent years, the cost of running the health service has mushroomed, and the "trou" or hole in the Health Service budget has grown ; this has led to the introduction of token charges, a reduction in the reimbursement of certain medicines, and other cost-cutting measures. While the French health care system remains among the best in the world, and primary health care in France is generally excellent, waiting lists have begun to appear for certain types of specialist treatment, and some hospital services have been closed for economic reasons. Seine: one of the longest rivers in France, 776 km in length from its source, near Langres in the Haute Marne department, to its mouth near le Havre, on the Channel coast. The catchment area of the seine and its tributaries covers almost a third of the surface of France; the principal tributaries are the Marne, the Oise, the Yonne and the Aube. The seine is navigable for 445 kilometres from its mouth, and is particularly busy in the area of Paris. The original city of Paris was built on or close to (historians are divided on the subject) two islands in the middle of the river, known today as the Ile de la Cité and the Ile Saint Louis. SEITA - The Societe Nationale d'Exploitation Industrielle des Tabacs et Allumettes was, until 1999, the state-owned French national tobacco company. In 1999, it merged with the Spanish manufacturer Tabacalera, to become Altadis. Altadis was taken over by Imperial Tobacco in 2008. Sénat. The French upper house, the Senate is made up of 321 Senators, elected by indirect universal suffrage for a term of nine years. One third of the seats in the Senate are renewed every three years. Série noire : the expression is used figuratively to evoke a succession of disasters or problems. Litterally la Série Noire is an s imprint that published collections of fairly basic detective stories and crime fiction, mostly translated from the American. SMIC Salaire Minimum Interprofessionnel de Croissance : The French minimum wage. A person earning minimum wage is called a Smicard. France has had a minimum wage since 1950; the SMIC was introduced in 1970. In mid 2013, the gross minimum hourly wage in France was 9.43 € per hour - but net SMIC, after social security deductions, was 7.39 €. In France, social security contributions are due on all wages, even for the lowest paid.. Smoking : France is among the countries that has introduced widescale bans on smoking in public places. Indoor smoking has been banned in workplaces, shops, airports, railway stations, schools and universities, etc. since February 2007, and in bars and restaurants since the start of 2008. SNC. Société en nom collectif. A partnership; business structure without the advantages of limited liability. Frequently used for professional partnerships. SNCF : Société Nationale des Chemins de Fer : The French national railway company. SNCF still enjoys a virtual monopoly over passenger train operations in France, though this is scheduled to change. Freight operations have been opened up to competition since 2005, and there are now seven licenced freight operators, though SNCF still operates over 90% of freight services. See rail travel in France. Société Générale - One of the largest French banks, SG was rocked in 2007 by a stock-trading scandal that resulted in huge losses for the bank; however, it has largely recovered from this incident which occurred just as many banks were being shaken by financial losses connected to the collapse of the US sub-prime market. Société Protectirice des Animaux: See SPA. Soixante-huit, or 68 : the milestone year in French life and politics in the second half of the 20th century, when protests by students and workers almost brought down the French government, and led to sweeping changes in French society. The events of 68 were inspired and led by the young generation of the time, wishing to break out of the rather stuffy and conventional society of the time. They coincided with, though initially took a different form to, the ‘youth revolution’ in Britain and the USA; but while the UK’s youth revolution was essentially social and cultural, and led by pop music and op art, France’s revolution was political and cultural, a protest against the weight of the Gaullist state. The events of May 68 started on the drab concrete campus of the sprawling university of Nanterre in the northern suburbs of Paris, and quickly spread to other universities, notably the Sorbonne. Student leaders, among them Daniel Cohn-Bendit and Alain Krivine, called for radical change and the end of the ‘bourgeois state’; students erected barricades in the Latin Quarter, and were soon joined by workers, notably from the huge Renault plant at Boulogne Billancourt in the Paris suburbs. Though political, the movement sidelined all existing political parties, including the Communists, considered by the new left-wing as being an ‘obsolete’ political force. Faced with turmoil on the streets and a partial collapse of French society, President de Gaulle fled to Germany on 29th May, before returning and promising new elections. But by the time the elections took place, the Grenelle agreements had been negotiated with the trade unions, the heat had died down, and many French people had become seriously alarmed by the turn of events. In the June elections, the Gaullist majority was returned to power with an increased majority. The events nevertheless marked the beginning of the end for de Gaulle. In 1969 he organised a referendum on decentralisation, promising to step down if the referendum failed. To a certain extent, de Gaulle’s vision of decentralisation was not that wanted by the voters; but in addition, the referendum became seen as a plebiscite on the Gaullist system, rather than on decentralisation. The referendum proposal was rejected by 52.4% of voters, and de Gaulle stepped down. It is certain that a new France, less hide-bound, more emancipated and more free, emerged in the aftermath of 68. Whether this would have happened anyway, and whether the means justified the end, are questions about which there is still considerable debate in France to this day. Soixante-huitard : « Sixty-eighter », person who lived through, influenced or was influenced by the ‘events’ of 1968, soixante-huit. “Soixante-huitards�? are reputed to be strongly anti-authoritarian, anti-establishment and very individualistic. The word is often used as a term of disparagement, as soixante-huitards are blamed by many French conservatives, including Nicolas Sarkozy, for exercising a strong but not always constructive influence over the evolution of French institutions in the forty years since the “events�?. Soldes, les : Sales (in the sense of cut-price sales). In theory, France has strict laws governing sales.There are two periods of the year when shops can put on sales, one in January-February (les Soldes d’hiver) , and the other in July (les Soldes d’été). The precise dates are fixed by the governement, and may vary from town to town. Other than closing-down sales, these periods are the only times of the year when shops can announce that they are having ‘sales’. As a result, most shops and traders’ associations revert to various other forms of terminology, and sales techniques, to put on events that are soldes in all but name. Les 3-Jours, or Quinzaine commerciale, or journées discount are three examples. Alternatively, shops fill their shelves with special offers. Sorbonne, la - One of the world's oldest universities, founded in 1257. The Sorbonne is, historically, the University of Paris. Following the breaking up of the huge university of Paris in 1970, into thirteen smaller (but still large) universities, the word "Sorbonne" was kept in the name of four of the new establishments, and specifically in the university now known as "Université de Paris IV - Sorbonne". This is the top-ranking Paris university for the fields of arts and social sciences. The three other "Sorbonne" universities are Paris III Sorbonne nouvelle (arts and social sicences), Paris I Panthéon-Sorbonne (Law, economics and human sciences), and Université de Paris V - Descartes, Sorbonne (Medecine, maths, law and social sciences). These four universities share the historic Latin quarter university buildings, but also have campuses, teaching-blocks, libraries and research facilities throughout Paris and the inner suburbs. See higher education in France. SOS Racisme : Anti-racist youth organisation set up in 1984 in response to the rise of the Front National and xenophobic attitudes in many French cities. Among the founders of the movement were Harlem Désir and Julien Dray, both now influential members of the Socialist Party; for this and other reasons, SOS Racisme has been accused of using the issue of racism for political ends; despite this, the organisation has played - and continues to play - an important role in promoting racial harmony , and raising people's awareness to the dangers of racism in France. Sous-Préfet : Sub-prefect, the representative of a Préfet , in charge of a "Sous-Préfecture", the local offices a main Prefecture located in the major secondary towns of a department. St. Pierre et Miquelon.The only remaining French territory in North America, St. Pierre et Miquelon are composed of a group of small islands in the entrance to the St. Lawrence river, some 100 miles south of Newfoundland. Stade de France: France's most prestigious sports stadium, opened in 1998. The 80,000-seat Stade de France is located in Saint Denis, in the northern suburbs of Paris, midway betwen central Paris and Charles de Gualle (CDG) airport. It is the venue for the most important football and rugby matches in France, and for major Athletics events and concerts. Strasbourg : Capital of the Alsace region, Strasbourg is one of the two seats of the European Parliament. Located a short distance from the west bank of the Rhine, Strasbourg is the seventh largest city in France, and its urban area has a population of over 700,000 inhabitants. The city was recently linked to Paris with the new eastern TGV service. Strauss-Kahn, Dominique : professor of economics, minister of economics in the government of Lionel Jospin, later appointed head of the IMF, and credited with very successful management of the post 2007 economic crisis. Popularly known as "DSK", Strauss-Kahn was widely tipped to win the French presidential election in 2012 as the candidate of the Socialist Party. But in May 2011, he experienced a total fall from grace after being accused in the USA or sexual assault on a hotel cleaner - a charge he strenuously denied. Photos of the handcuffed and dishevelled DSK being led by New York police caused outrage in France from DSK's friends and foes alike, since the publication of such photos of a person considered innocent until proved guilty is quite illegal under French privacy law. However in spite of DNA evidence of a sexual encounter, all charges against him were later dropped following evidence of inconsistencies in the allegations of the plaintif. SUD: Acronym for solidaire, unitaire et démocratique , used in the name of a number of militant left-wing unions, notably in the railways, in the state education system, and the post office. SUD unions were initially set up in the 1990s by militants who felt that the main unions, the CGT and the CFDT, were going soft. Suez : Name of a Franco-Belgian industrial conglomerate, which merged with Gaz de France in 2007, to form GDF-Suez and Suez-Environnement: GDF Suez is the world's thrid largest energy company. Suisse normande: nickname given to an area in the south of the departments of the Calvados and the Orne in Normandy, on account of its hilly terrain, unusual for this part of France. Though the hills are graced by a few crags, they only reach a maximum elevation of 345 metres and are can in no way be described as alpine. Suisse romande : The area of western Switzerland which is French-speaking; this is made up of the cantons of Geneva, Vaud, Neuchâtel, Jura, Valais, and a part of the canton of Fribourg. Surface area. The surface area of France is 550,000 km², making it the largest country in Western Europe, and about 20% of the total surface area of the European Union in 2002. 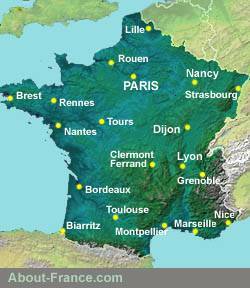 Two thirds of the surface area of France is covered by plains, largely agricultural, the remaining third by several ranges of mountains, notably the Alps, the Pyrenees, the Massif Central, the Jura, the Ardennes, the Vosges and the Morvan. 26% of the surface area of France is now covered by forest, the French forest being the third most extensive in Europe after Sweden and Finland. The proportion of France covered by forest (see Landes, Forests) has doubled in the past 200 years. Syndicat: the French term for a trade union, or labor union. In France, trade unions are generally large organisations that spread across all sectors of labour, rather than sector-specific unions, and they are differentiated from each other by their political militancy and attachments. The three biggest unions are the CGT (formerly linked to the Communist party), the CFDT, and F.O. (Force Ouvrière). Many sector-specific unions (such as the SGEN - CFDT - Syndicat Général de l'Education National) are federated within these larger organisations. French trade unions have a degree of political and social power in France which far exceeds their representativity. Trade union membership in France is low by international standards - around 10% of the workforce (which is lower even than in the USA); yet as virutually the only form of legally constituted employee organisations, unions benefit from the position of privileged "social partners" (partenaires sociaux) in a whole range of situations where decisions must be taken after discussion between employers and employees, or government and representatives of labour. See also paritarisme, SUD. Syndicat d'Initiative, S.O. - The old term used to describe what is most often called an "Office de Tourisme", or Tourist Information Centre, in more recent terminology.